Why is the Super Bowl my favorite time of the year? I totally don’t follow football the rest of the season. I’m more of a baseball girl (86 Mets!) but honestly, haven’t really paid attention since the Subway Series. Yet when this time of year rolls around I’ve suddenly got team spirit, even if I don’t even know which teams are even in it. I have taken existential inventory of my actions and I think I have the answer. It’s…well, it’s the wings. It’s all the food, really (here’s a few of my Superbowl recipes.) But wings in particular give you carte blanche to eat all of the Frank’s that your heart desires. And my heart desires a lot. This is such an easy way to capture the essence of buffalo wings. A spicy, tangy chickpea salad, a cooling dollop of ranch and fresh crunchy celery. All in one little bite that won’t leave your fingers greasy! Oh, and everything takes like 20 minutes to put together. So go on, whip this up and invite over some other friends who have no idea what’s going on. But make sure that you switch back and forth from the Puppy Bowl. This year there is the Kitten Bowl, too! ~Vegannaise in the purple jar is a good choice! Just try not to use too thin a mayo or the dressing will be runny. ~Chop the herbs as finely as possible for best results. Really, you want them closer to minced. ~If you don’t have tahini, that’s fine. I love the nuttiness it brings to the table but you can also just add some extra mayo. ~If you are a total spice wimp, start with 3 tablespoons of hot sauce. But really, I’d almost be inclined to say, if you’re a spice wimp, skip this recipe entirely since it’s pretty much about the spice. In a mixing bowl, use an avocado masher or a strong fork to mash the chickpeas well. They should retain some of their texture and not appear pureed. A few whole ones left are ok. Mix in the mayo and tahini and give a few more mashes. Salt to taste, if needed. It should be salty enough with the Franks and mayo. Just mix all of the ingredients together in a little bowl! 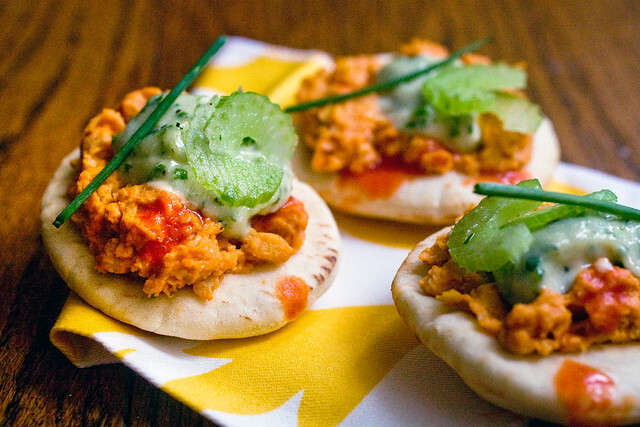 Place a tablespoon or so of chickpea salad on a pita. Add a dash more Frank’s if desired. Top with a dollop of ranch. Garnish with a few slices of celery and a piece of chive. @ Jenn – In my experience Texas Pete is a good substitute for Franks. Crystal Louisiana Hot Sauce is okay too. I wouldn’t go with Cholula, myself – but that might be the upstate NYer in me 🙂 It’s not the right kind of spice for “wings” and things. i would say frank’s is magical. … i never am without a big bottle in the fridge. my hubby likes texas pete. If I made these I would probably hog the whole batch and not let anyone else have any. They look so good! Great minds think alike! I made a nacho recipe with buffalo chickpeas and ranch sauce as a riff on my Buffalo Chickpea Mac, last week! Loving your take! making this for lunch but stuffing a regular pita with the filling and ranch 🙂 Maybe I will chop the celery and add to the mix Love your recipes, Isa! So making this on Sunday,have no idea about Super Bowl but yeah making it!! @jenn I carry a small bottle of Franks with me in my purse so i have it for my lunches at work! This ranch recipe is different than the one that goes with the Buffalo Tempeh, which I find a little too runny. Going to sub this one instead! This one turns out super thick. Why do I have so many ranch recipes? I always forget. These look delicious! Unfortunately I’ve never come across mini-pitas where I live. For those who’ve tried this, do you think the topping would work well on top of crackers? Just cut regular pitas into quarters? I think it would look nice. Yesss. I’m always looking for veggie versions of buffalo snacks. Seitan wings are my favorite. Love the idea of hummus. 1. brilliant idea. i’ve never had hot wings. now i’ll have a clue. 2. Kitten Bowl? i’m gonna hafta find a TV on Sunday. Those are beautiful! I can’t wait to try them. I’m in England and I don’t think we have hot sauce as such. Could you please read the ingredients off the bottle so that I can see what I could use instead? Thanks. These need to get into my mouth right now. I’m so glad that the boy does not like ranch so I can keep these all to myself! New idea: buffalo deviled mini-potatoes. Isa has an amazing recipe for deviled mini-potatoes on PPK. Maybe it could be morphed into a buffalo recipe…. hmmm…. I made this yesterday, it’s so good. Today I having it on a wholemeal bun with iceberg lettuce – yum. Easy and delicious. Made these for a party we are going to and i can’t stop eating them. Thanks. This is ridiculously good! Just made it. It’s my new fave app! Thanks, Isa! Do you take the skins off of the chickpeas before mashing or leave the skins on? I am kind of a spice wimp, but I went for the whole 1/4 cup of hot sauce and it was fabulous. It had good heat but was pleasant, not too spicy. I served it for the Super Bowl and didn’t have time to dress up individual pitas, so I layered the hummus, ranch and celery on a platter and served the pitas on the side- it got devoured. YUM! Thanks, Isa! These are fantastic!!!!! You are a genius!!! Being vegan and addicted to the spicy nostalgic memories of crusty wings? My downfall! If you say these Pitas can chase the cravings of my meaty past away, I am definitely making them! And I won’t be waiting for the next Super Bowl. I might go easy on the dill though, since it’s not one of my favourite ingredients. I will probably try to substitute it for something different or just go on without it. There is a good vegan restaurant in TO that makes the best vegan comfort food. If only they were willing to share their recipe for wings! If you are in Canada some time soon, you might want to give it a shot. Do you also have a recipe for homemade pita bread? I imagine it is somewhat similar to making pizza dough? The presentation of your Pitas is lovely, love the pictures! Wow this looks incredible! I’ll be home in 2.5 weeks and I’m making this THEN!!! Mmmm! Thank you Isa! I just made this and I’m pretty sure this recipe is my life now. It is so so good! I just made mine for lunch as sandwiches on a whole wheat bun with a little lettuce and the ranch slathered on the bun. I’m thinking that tomorrow for lunch I will use whole wheat crackers to scoop it up and serve the ranch on the side with some carrots and celery sticks for an extra dunkage factor. This is super simple and quick to make and works great as a snack or as a meal! Thanks!!! I am a new vegan! Since the beginning of the year I had made it a point to greatly reduce the amount of meat in my diet, but I was still eating eggs/milk (not a lot). In the last two weeks I have decided to give up milk/eggs also. I saw this recipe and decided to try it. I made your homemade mayo a few days ago (to let the flavors meld as you had suggested). Then last night I transformed some of it into the ranch dressing. Mashed up the chickpeas this morning to let it chill into lunch. I have to admit, I was dying to try a bit, so I did. Let me just say, it tastes so good. I am glad I doubled the recipe (BTW for other readers–a single batch of mayo is enough to double the chickpea recipe and still have enough left for the ranch dressing). 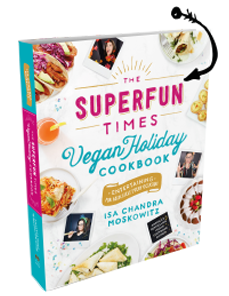 I just want to say “thank you.” Being able to obtain some of these recipes online makes it so much easier to for a newly starting out vegan. I feel so encouraged right now. Definitely going to stick with this healthy and un-cruel way of life. @Danielle–I couldn’t find any mini-pitas either. I just picked up some full-sized pitas and sliced them into 6ths. Worked out great. Wow! I am so in love with this recipe! The ranch is excellent and the chickpeas have the perfect spice. I will definitely be making this often! Hello Isa, and others that have made this, do you think the recipe would suffer if using dried herbs? As if it wasn’t delicious enough with veggies and chips and in a wrap… today I cut a bunch of veggies and put it all together for a pasta salad! So yummy! 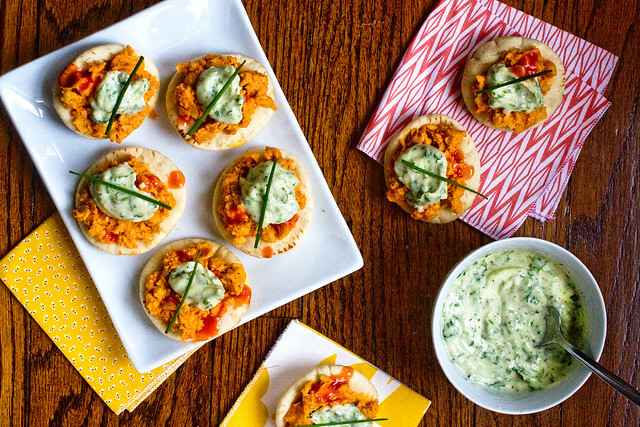 Is there anything chickpeas can’t do? I love these as tacos topped with the Cool Slaw from AFR. Yum! Well, I am totally addicted. Didn’t get as far as making the ranch to go with this but put the chickpea mixture in celery stalks and ate nearly the whole thing in one sitting. Sooo good. Thank you Isa. I made this for a potluck today (on crackers rather than pita) and it was a huge hit, even with the omnivores. Really awesome. Thanks!! I made this today and it is delicious. I don’t have tahini so I used some cashew butter instead. Thanks Isa, love your cuisine! I made these for a family get together and they were amazing and everyone (all non-veg) raved about them. I ended up buying the smallest pita’s I could find (palm size) and cutting them into quarters. Not sure if mini-pitas are still being made. Its yummy taste wise but a little much in the sauce. 1 TBSP ea tahini and mayo would be plenty. Ps thank you SOOOOO much for turning me on to Franks Red Hot, your recipes are the reason I tried it in the first place and now i cant imagine life without! Buffalo chick pea tacos. Use a cabbage slaw instead of lettuce. Maybe some pickled red onions, too. Isa, you are amazing!!! I’m from Buffalo and love, love, love Franks and this recipe completely satisfies this Buffalo girl when I need my fix. What is Frank’s red hot? What is substitute outside of US? Spicy sauce made from hot peppers. Sambal oleck, chili paste, or other sauce made from hot chilies. I made these for dinner last night. Completely easy and completely delicious! These will be a staple. I used the Tabasco brand Buffalo-style sauce. Yum! I freaking LOVE this buffalo chickpea mix. I’ve made it a million times and find it to be very versatile. I use it in sandwiches and in wraps, of just binge eat it on crackers. The ranch is a real winner too. But seriously you guys need to get the holiday cookbook because there is so much fantastic stuff in there. This is on my weekly dinner menu rotation. My family loves it! Thanks! May I simply say what a comfort to uncover somebody who genuinely understands what they are discussing over the internet. You definitely realize how to bring a problem to light and make it important. More people ought to look at this and understand this side of the story. I was surprised you’re not more popular given that you most certainly possess the gift. They look so cute i ll definately try to make this recipe!